Relatively new discovery for me, don't know how I missed this artist (leader is San Francisco-based Andy Cabic, his producer/collaborator is Thom Monahan) but happy to come across it... very well-done West Coast pop/rock in the grand tradition of such (you know all the usual suspects, if you like them, you will likely enjoy this). On Bella Union in England, Sub Pop in US. This week's Midnight World Pop Scout takes us to Wellington, New Zealand, Dublin, Ireland and San Francisco,California / Baton Rouge, Louisiana. Wellington, New Zealand's The Eversons believe indie pop should be about loud guitars, musical hooks and nerdy Jokes. The members of the band are Mark Turner, Tim Shann, Blair Everson, Christopher Young. Here is their song "I'm A conservative. They released The Eversons EP in April, and the entire EP can be streamed here, and downloaded at the Lil' Chief Records link below. Their label finds similarities with Modern Lovers and Pavement. Painted Palms is an synth-based group consisting of Reese Donahue and Christopher Prudhomme, and lists home as San Francisco and Baton Rouge. Their music is made in their bedrooms and released on Secretly Canadian. Seattle readers should note that the group will be playing at the Capitol Hill Block Party in July. Sacred Animals is the name used by Dublin musician Darragh Nolan. Nolan's music is a mix of indie, electronic, psychedelic, folk and ambient. He is signed to Delphi. Sacred Animals probably has a pretty good idea of what he's doing with his music. But to me, he also is providing a background for us to imprint our own thoughts and stories on his tracks. And that is a gift. Stream the 2010 EP Welcome Home here. If you like it, download it free at the Bandcamp link below. I recently discovered the lo-fi shoegaze delight that is Brighton and London's Fear of Men. Actually, discovery is a term that flatters me too much, as all I did is search the internet after Ben Ward at SWAYS Records recommended that I check out the band that was playing with The Louche FC. Note to self, Ben may have good taste in music. Fear of Men are Jessica, Daniel, Lin and Antony. I do not believe that they have recorded any full albums or LPs, but they have provided the following four singles via Bandcamp. According to my research, the members are split between homes in Brighton and London. I think the band was fairly recently formed, and at least some of the members are film fans. 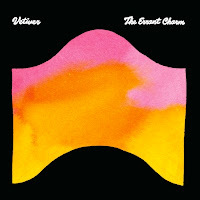 The melodies are upbeat, the vocals engaging, and the instruments fuzz and jangle in all the right places. However, to say much more would just be making things up, so I recommend that you dive into the following tracks for a perfect Saturday soundtrack. Old Stuff Friday - The Soul Corner "Grits Ain't Groceries"
We're going Deep South this week. From the Mississippi Delta, the great Little Milton with his late '60s hit "Grits Ain't Groceries". The opening stanza of these lyrics is an all time classic. You are hooked from the get go. Many know the title line "grits ain't groceries" from the George Jones country hit "If I Don't Love You". While I love that song too, this here is the soul corner and George Jones ain't stepping on. But you should look that one up too. For today's "old stuff" contribution I am providing some examples of top reggae vocalists. Some of these artists may be known to you and some may not. But they all share a mighty vocal instrument and an innate ability to express that, had they grown up in the US, likely would have given them a chance at stardom in Detroit, Memphis or LA. Junior Murvin. The Clash's version had a nice edge, but this one is a vocal delight, and reflects Lee Scratch Perry at the height of his production powers. Marley was called the King of Reggae, but Dennis Brown was known as the Crown Prince. He was successful as a solo artist, writer and producer. My personal favorite is Gregory Isaacs, who was known as the "Cool Ruler". Yes, this is a cover, but Al Brown nails it. And if you like reggae covers of American R&B and soul, the Blood and Fire label published a great compilation titled Darker Than Blue. One of the best voices of the rocksteady era belonged to Pat Kelly. Delroy Wilson was known as the Cool Operator, and so is this song. And here is the silky Ken Boothe. Booker Jones certainly needs no introduction. He's been producing iconic American music since his teenage years, when his parents had to make a choice to let him pursue his passion in late-night clubs in parts of Memphis most folks have never heard of. In the liner notes to this disc, Jones talks almost longingly about those years, when he was learning about the world beyond Millington, Tennessee and learning about how much fun it could be to make music for a living. Then he talks about the road from Memphis, and of course we read those notes with knowledge of what he did from then until now... teamed up with Steve Cropper, Al Jackson and Donald "Duck" Dunn to form the MG's and made soul music that was never equaled. Whether your cup of tea is "Green Onions", "Dock of the Bay" or one of dozens of other soul classics on which his Hammond B-3 was indispensable, Booker has been providing soul to our popular soundtrack for over 40 years. Over the years, he's worked, either as a producer, sound engineer or by providing support on keyboards, with artists as diverse as Albert King, Willie Nelson, Kris Kristofferson, Rodney Crowell, Neil Young, Bill Withers... the list goes on and on. The Road From Memphis is a treasure. 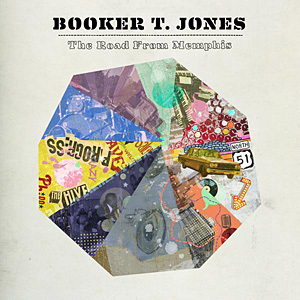 It represents the interaction between Booker T. Jones and a new generation of musicians. This record features a supporting cast as diverse as any you will find: co-producer and percussionist ?uestlove, Captain Kirk on guitar and Owen Biddle on bass (The Roots), Detroit guitarist Dennis Coffey providing some of the great guitar licks he's been playing since his days in the Funk Brothers (Motown's legendary house band), My Morning Jacket's Jim James, Lou Reed, Sharon Jones and The National's Matt Berninger... and it succeeds, mainly because of the common ground the players all find here. Sound engineering is provided by the Dap-Kings' engineer, Gabe Roth. As on his previous release, Potato Hole, Booker takes a contemporary earworm (last time, it was "Hey Ya", this time Gnarls Barkley's "Crazy") and provides a scorching organ line to fill the vocal's role on the original. While very enjoyable, this track is topped by what is, in my opinion, the best song on the record, "Progress". Jim James sounds like he was born to sing soul music, his voice and trademark reverb fitting in perfectly with the sounds Booker, ?uestlove and team are making here. Book recommendation - Bob Mould's "See A Little Light"
I am a sucker for music biographies. But trust me, Bob Mould's autobiography, See A Little Light - The Trail of Rage and Melody, is as good as they get. It's unflinchingly honest, insightful, and self-depreciating. And Mould has a great story to tell - the rise and collapse of Husker Du and then Sugar captures an incredible legacy of urgent American rock. There are compelling sub-stories here too - being a gay man in a macho punk rock world; Mould's complex relationship with Husker Du co-leader Grant Hart; navigating the indie label scene with influential SST then moving to major label Warner Bros; riding the wave of being in one of the most respected yet underground bands in America; and being a part of the very fertile 1980s indie rock scene in Minneapolis. The book is well written with help from Michael Azerrad (author of another must read rock book Our Band Could Be Your Life: Scenes From the American Indie Underground, 1981-1991). Bob Mould's integrity, always the foundation of his artistry, is captured here. He is never self-aggrandizing about his accomplishments nor defensive about his missteps. He is a terrific storyteller, and of course he compiled a treasure trove of them on the road with Husker Du. And it's great fun to go behind the scenes to the making of some of best American rock ever - a relentless combination of raw power, catchy melodies and whip smart writing. But Mould's personal history is at times gut wrenching, of course all that rage didn't come out of thin air. We profiled Seattle psychedelic/garage rockers Black Whales earlier this year as an emerging Seattle band with a sound and energy we really liked. Happily for us and their other fans, the guys are releasing a new LP, Shangri-La Indeed, on June 28. 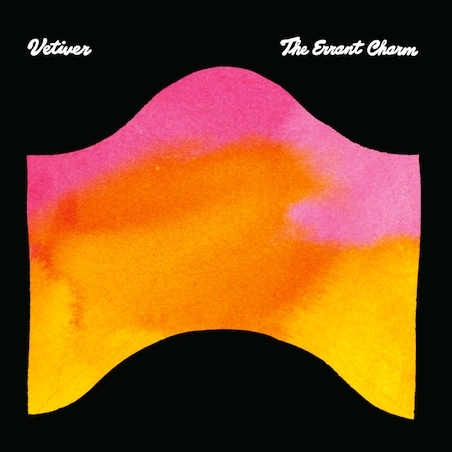 For me, it is just what the doctor ordered: Reverby guitars crunching and jangling over a driving rhythm section and showcasing a very good set of songs. This band really should be better known, and I hope this album helps them break through. Sequencing an album is a tricky but important art. Black Whales got that task right by opening the album with the title track, "Shangri-La Indeed". From the opening strains I knew I was going to give the full album a chance. But first I hit the repeat button for "Shangri-La Indeed" a few times. All in the name of research, of course. The members of Black Whales are Alan, Alex, Dave, Davey and Ryan, and clearly they have a good working relationship. The vocals and instruments are spot on and there is no sign of growing pains. And the production is clean and clear. Overall, it has the timeless feel of classic American power pop that never goes out of style. I liked all of the tracks on the album, but my favorites, in addition to the title track, are "Walking in the Dark", "Young Blood", "Rattle Yer Bones", and "Elephant #2". Although if you asked me tomorrow, the answer might change. While I normally don't get involved with such details, I'd be remiss if I didn't point out that the band is offering a "half price sale" on the album. If you order now, you get three tracks immediately. On June 28 you'll get the download code for the remaining tacks and the CD will be shipped. You pay $5.00 in total. Details are on their website. From Breakbot, a little art class "Fantasy". Breakbot: Fantasy from Ã–naz on Vimeo. Yuck gives us the interesting but PROBABLY NOT SAFE FOR WORK "Shook Down". This band has a great sound, doesn't it? The Rosebuds - Woods from Merge Records on Vimeo. Belle and Sebastian with "I Didn't See It Coming". I Didn't See It Coming (Richard X mix) from Belle & Sebastian on Vimeo. And not for something a bit different: Scottish musician Tragic O'Hara makes music with a guitar made out of a piece of wood, a cigar box and a bolt, plus a sampling machine. Since we didn't have anything else up today, we moved Cool Video Thursday to Wednesday. If this is offensive, please fill out form 697A-492.3(revised) and submit it to the Customer Service Department. This probably was the beginning of the microphone culture: Beats, melody, and sometimes vocals in the background, and the man on the mic, chatting about what's on his mind. It has spread through rap, dubstep and even rock, but it began in Jamaica's dancehalls. Perhaps the first DJ, or "toaster" was Count Machuki who, in 1950, made "musical wisecracks" over the U.S. R&B he was spinning for the crowd. He continued to do it, and started working Harlem street slang into the mix with the Jamaican slang. In various stylings, Sir Lord Comic, King Sporty, and Prince Buster continued the practice. In the late 60s Winston Spark, aka King Stitt became a pure toaster. However, the most popular of the late 60s DJs was Ewart Beckford, who performed as U-Roy. His recordings for Duke Reid in the early 80s dominated the charts, inspired DJs who followed, and resulted in his nickname, "The Originator". This track demonstrates the style: The Paragon's "Wear You to the Ball", with U-Roy toasting over the top. In "Camp Road Skanking", I-Roy uses Junior Delgado's vocal over an original Heptones cut called "Get in the Groove" as a launching pad for his own thoughts of the day. It also is a Niney Holness production. Here is a prime example of Big Youth's social commentary -- "Train to Rhodesia"
Our last artist for the Early DJ edition is Dillinger. The chosen track is "Flat Foot Hustling", which features Dillinger toasting over Dennis Brown's "Have No Fear". If you had guessed that the crisp production is attributable to Mr. Holness, you were correct. Well, Dillinger was the last artist, but the last track goes to Big Youth's iconic S.90, about his beloved motorbike. An early line is "if you ride like lightning, you'll crash like thunder. 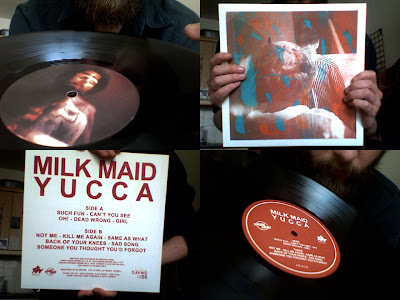 This Manchester, UK group seems an appropriate subject for a blog that takes its name from Guided By Voices, because the crunchy DIY indie rock of Milk Maid seems to me to be a good fit with Bob Pollard's musical sweet spot. The hooky melodies and guitar driven sound of their impressive debut release, Yucca, have drawn justifiable comparisons to Guided By Voices, Woods and Kurt Vile. But there is a decided The Jesus and Mary Chain noise pop strain that, in addition to the decidedly dark cast to the lyrics, personalizes the music to this band. The sound of Milk Maid illustrates the surprises one can get when members of bands step out into a lead role in their own project. Songwriter and frontman Martin Cohen also is the bassist for the currently inactive Nine Black Alps, which has a very different sound. Cohen's musical voice seems to spring from a merger of the early Creation Records era and the melodic pop of the 60s, and unabashedly reveals the highest quality influences. The guitars are omnipresent but vary from fuzzy to reverb to scuzzy, offset by a pulsing rhythm section and semi distorted vocals. I became a fan with my first listen to "Not Me", a noise pop gem which immediately shouldered its way into my list of favorite songs for the year. Milk Maid - Not Me from FatCat Records on Vimeo. In addition to Cohen, Milk Maid are Ian Hodson, Rick Entezari, and Luke Towart. The band is signed to FatCat Records, and is performing live in the UK in support of Yucca. A live version of album track "Girl"
With eleven songs, Yucca has many high notes. A couple of the songs grabbed me less than others, in particular, "Oh", but I can truthfully say that all the songs are quality. In addition to "Not Me", my highlights include the punk/garage "Such Fun", "Girl" (which has a Guided By Voices vibe, to my ears), Dead Wrong, the jangly power pop ballad of "Can't You See", and the slow burner "Same As What". Overall, this is a type of rock music I love, and I hope this band sticks around for a long time. A live performance of the album's opening track, "Such Fun"
Finally, if you subscribe to RSS feeds from their blog, you might get some interesting videos and you might get pictures of cheese sandwiches and snack foods from all over the world. Where else are you gonna get that kind of variety in your entertainment? 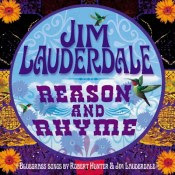 Reason and Rhyme is the third record by the songwriting team of Jim Lauderdale and Robert Hunter, the second in two years. The first two, 2004's Headed For the Hills and 2010's Patchwork River, were excellent country records... no surprise, for Lauderdale is one of the best true country vocalists in Nashville. This installment is straight-ahead bluegrass, and it is wonderful. Lauderdale's made some of the best modern bluegrass records, including several collaborations with Ralph Stanley, and has a great voice for it. The band on this record features mostly the same lineup from 2007's The Bluegrass Diaries, including producer and resonator guitarist Randy Kohrs, bassist Jay Weaver and Mike Compton on mandolin. This is a terrific combination: Lauderdale's approach to bluegrass and Hunter's vision of the unique American characters most will recall from his years spent writing with Jerry Garcia. Check out "Jack Dempsey's Crown"... a memorable barroom tale along the lines of Grateful Dead songs like "Wharf Rat". Lauderdale is one of the most unique artists working today. Check out his tour dates... On one day (June 24), he's playing a free show at the Opry Shop, appearing on the Grand Ole Opry then driving back into town on I-40 to get to the Station Inn, a bluegrass venue that's featured many, many appearances by Lauderdale and his cohorts over the years. He's a musical treasure, and this record is just further proof.